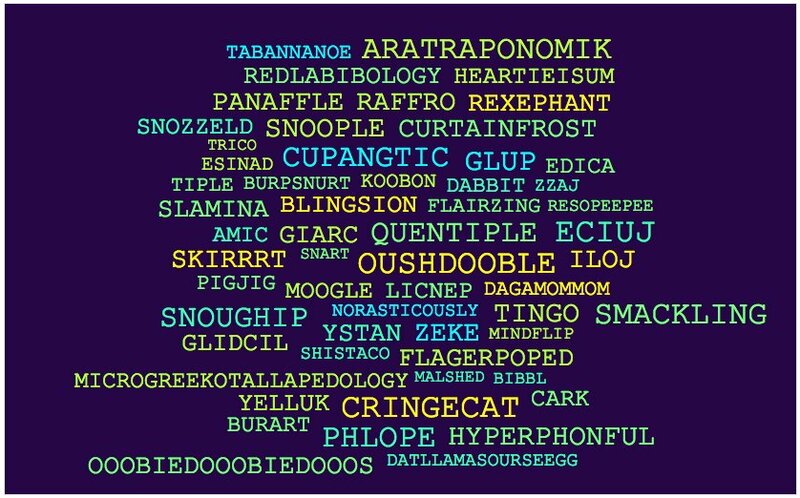 "this year's class of word inventors weren't even born when the first class of inventors began making up words in 2005"
This is a practical application of a strategy I feel should be in place in every volunteer-based tutor/mentor programs, as well as in K-12 schools and universities. I used this graphic to describe the strategy in the mid-2000s as I was trying to implement it in the tutor/mentor program that I was leading. 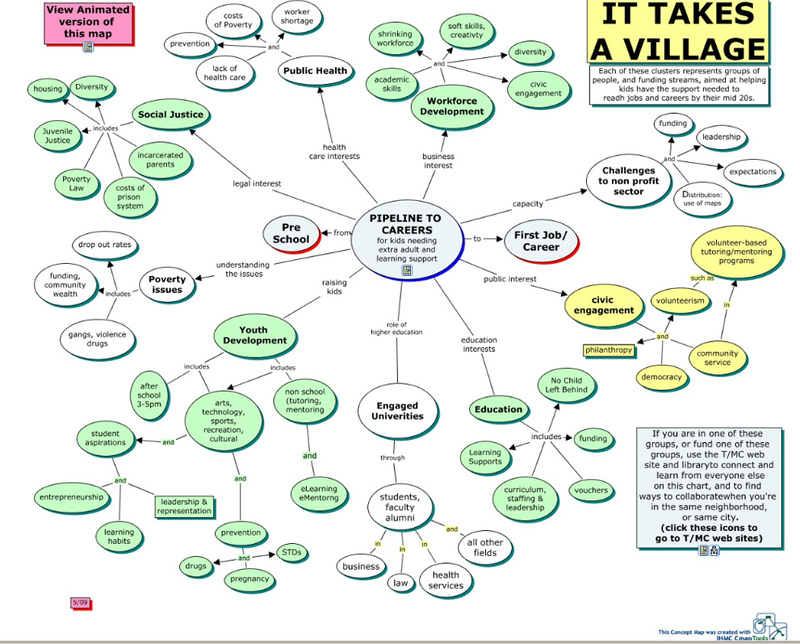 In this concept map I show a goal of building habits of learning, using the organization web site as a place find and share information and ideas, not just while students and volunteers are active, but in the years following their involvement. You can view the map here and read an article where I described it here. I don't know if Keven's goal was to build habits that motivated his students to continue to come back to see what's happening in his classroom, or to look for ways to help current students move through school and into jobs, but his site is a stepping stone toward such a goal. How does this apply to helping kids living in poverty connect with a wider range of adult support? 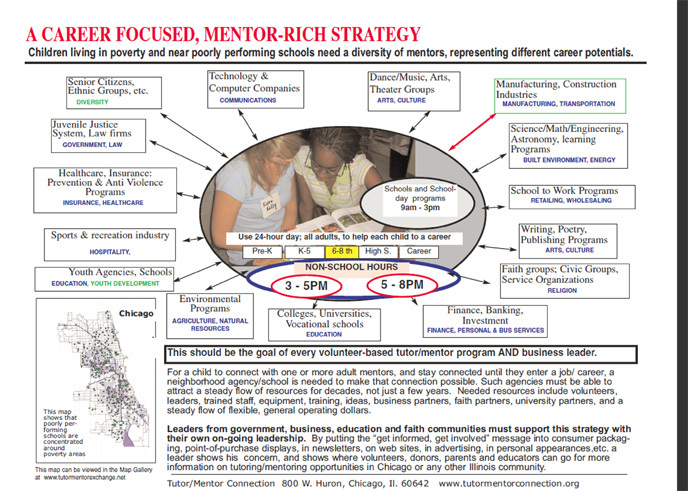 Look at the graphic below which I created in the mid 1990s to describe the program I was leading in Chicago. This hub and spoke design could be a model for every child, showing the adult support and learning experiences needed to move safely through school and into adult lives. 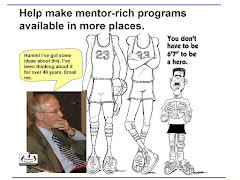 It could also be the design of a tutor/mentor program, showing how the program draws volunteers from many career and work fields together as tutors/mentors and leaders. It could also be used to show the types of learning and enrichment the program makes available to its members. It could be used by city leaders to show the type of programs they are trying to help grow in all poverty areas of a city. It's also the design of a classroom, with the teacher as the hub. It could also be individual students, who are the center of networks of peers. 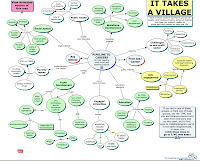 The "It takes a village to raise a child" statement can be turned into program design, and strategies, aimed at drawing students and volunteers together in long-term relationships. What Kevin has piloted, and what I'm showing with the concept map above, is an effort to build habits of learning and sharing, using a web site, wiki or some other on-line library and forum, as a place to get and give information, or to get and give help, far into future years when the student becomes an adult and part of the network of adults who are helping each other, and helping younger students rise up the pipeline from birth to work. I've been applying this strategy in my own efforts for many years. 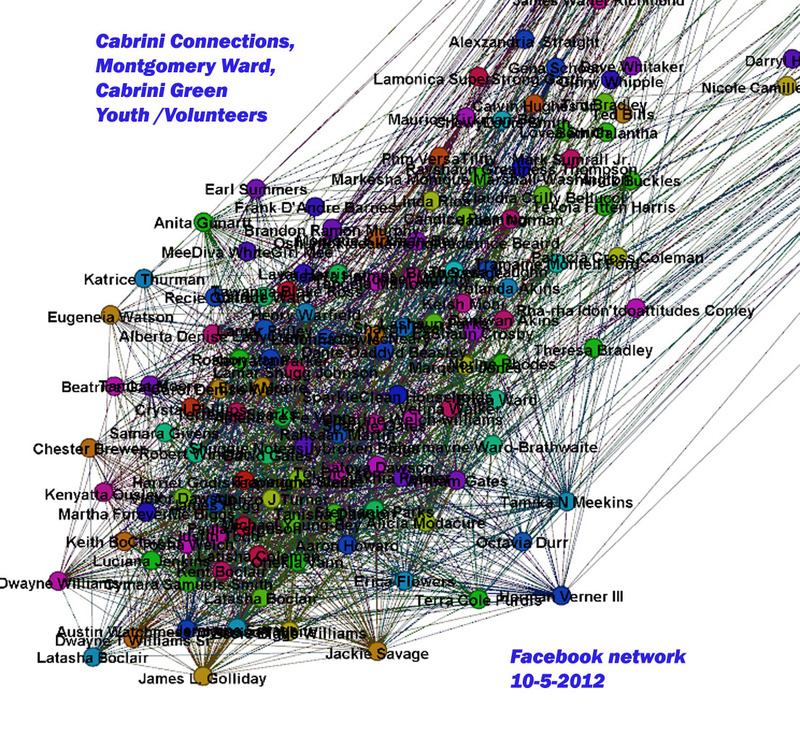 At the right is a graphic showing former Cabrini-Green area students and volunteers who I've worked with since 1973, who I'm still connected with on Facebook (in 2012). 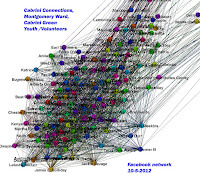 Here's a PDF with this and other network analysis graphics. Kevin has been maintaining his platform for over 10 years and has had to move it to different platforms as technology has changed. 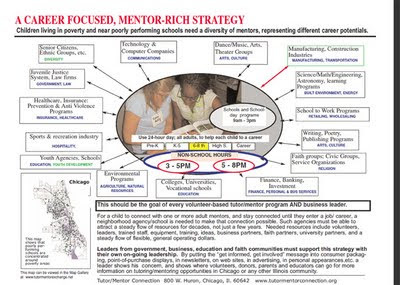 How many volunteer-based tutor/mentor programs have been in business for ten years? How many have databases of former students and volunteers and/or are using those to share information that helps alumni continue to grow in their lives, while also engaging alumni in work that supports the school, the program, and the young people coming up? Kevin has been able to do what he does, and I've been able to do what I do, because we've been consistently involved for many years. 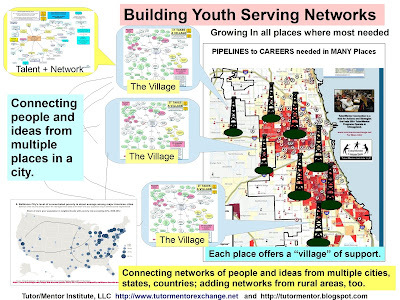 I focus on drawing talent and operating dollars to non-school tutor/mentor programs in high poverty areas because if they can't keep a core group of people involved for a decade or longer they can't build this type of learning network. If you're a champion of mentoring, or concerned with urban poverty, inequality and violence, this should be something you focus on. I don't know who reads my blog among the many programs I point to on this list of Chicago programs, or this list of programs from beyond Chicago. I do know that many of those I'm trying to connect with, and help, don't make an equal effort to connect with me. Just looking at the Twitter list of organizations and people who don't follow me back illustrates this. However, when I see people in other states, like Terry Elliott, paying attention to what I'm writing, I am encouraged to keep sharing these ideas. I hope by sharing links to their work others will make an effort to duplicate some of these ideas. Your theme of focused involvement for change is a constant, Daniel, and one that I appreciate, particularly in these times of fickle and shifting priorities, and funding. Thanks for the post that ties together a few different ideas with a singular message: staying focused on kids is how we make a difference in their lives.